Love being able to get so much good information on possible homes. Needs a filter for people who only want to look at single-story homes. I like that Realtor includes all the different Realty company listings. A 1 stop shop. More precise than the website. Great App! Hangs sometimes but not enough to be a nuisance. App has been hanging up on latest iOS. Great app, love the map searching feature. Love this app it’s reliable and just amazing. Love this app. Easy to navigate anywhere. Updates quickly also. Help me find a new place to call home! Pictures are clear, gives you all details about the house. Best app for finding a new home! I love this app. We’re considering moving in the near future and this has helped a lot. Great app with up-to-date information. Somewhat awkward to navigate and missing key info. Better than the others for accuracy. Lots of good info about properties and photos too. Very helpful. This app always has the most up to date info and the most pictures. We like it better than Zillow. Almost as functional as being on the website. Like the app, but needs a little work on preferences. Overall, good app and helpful. Simple to use and gives the users quality information on properties. This app is really put together nicely. User-friendly functionality is great! Of all the real estate apps I’ve used - this is the best. I love how easy this app is to use and how it stays updated with new listings! Great App! On it EVERYDAY! I love this app, so easy and very accurate. I love this app! I’ve been watching my local housing market for months and it’s so easy with this! Great app., easy to use, and beautiful real estate selections. Easy to use. And it's fast. I like the app but there are more listings in my area than what this shows. It’s ok. No more bells and whistles than the website. Good. Pics are a little slow compared to Zillow but great resource. Like app much better than Trulia app. This app just keeps getting better and better. Love it. We’ve found our last 3 houses on this app...easy to use! Like the app. It makes looking for houses real easy. I get notifications, but nothing shows up. Filters don’t work correctly. Pads very slow. Has everything you need to make a decision on the property you are looking at. I find the app helpful and convenient. Functions well. This site is good and usually correct. Doesn’t show all the houses. On the market but about 85%. Good map accuracy to help locate potential listings.. This app is so user friendly, love how it gives the monthly mortgage payment and breakdown. Loved it as the premier real estate website 15? 20? years ago. Love the ap now. Able to be more specific on amenities! This is is great app to help search for your new home and neighborhood. Your program works great and is very efficient! The search set-up and usage is very dependable. Great app. Love the current location feature. Works great whether I’m in Florida or California. The homes are easily found. Great filters, updates as soon as the realtor puts the data in the system, what’s not to love? The best real estate app! Has most of the critical info a home buyer needs. Easy to use and filter to get specific results. This app is very up to date and useful when it comes to current houses on the market. The titles says it all. Satellite views would be nice! Love that I can Circle the area I want! Not a 5 because I wish it had more information like sale history on the property, for example. This app provides you with all your housing needs. Makes it so easy to find properties. Pretty easy to use. Searching for lesser known spots which the map option helps with. Great app but can be improved! Please show the price history and allow user to manipulate the mortgage calculator. Great place to look for a new home without leaving our house!! I have noticed that this app has more listings and updates versus another app I am using. I can view and analyze properties all across the US. Easy to use with good information! Ability to change search areas is great! The school information is often inaccurate, especially for middle schools and high schools. 7 years since I used this app. I enjoy looking into realtor.com to see if I could find a home and a great price for me. Has everything you need when house hunting. Absolutely love the accuracy, distance to Home and square footage of properties. Good app but I would like the get notifications if a house in my saved searches or favorites is sold or off the market. And get a notification if a new house is listed in my saved searches. If this already exists it’s not working. **update** The notifications now seem to be working for new listings and price reductions but it would be great to get a notification of a new open house and if a house gets sold. Truia has both of these features but I like this app better so hopefully they will update. Also the info is not current most times like other users have stated. I use a number of real estate apps, looking for a possible retirement home half a continent away. Many others have an extra feature or two that I prefer, but this is my ‘go to’. It’s the easiest to use, especially for someone looking at a wide range of possible locations, and is as complete as any in terms of number of properties shown. I check the app daily or at least weekly for local properties. It is very easy to use. Great site to explore what we are looking for in the way of house and land! Big help for people moving! Great app, easy to use. Indispensable for home shoppers! I would like to see how many people have viewed the property along with how many saved the property. Easy way to keep track of listings. Seller and Buyer for 9 homes. I have used this website for a long time. It has been my best resource for selling and finding homes. I have lived in 4 States and not only was finding locations, homes and reality information important but it helps organize and keep you up to date with what is going on in the market. After the new update I’ve been receiving notifications for “Recommended” listings. Some days I get 9 or 10 notifications. Some of the notifications are for the same listing. For example, in a 24 hour period I was notified about the same listing twice. Also, the recommendations are for areas that I have never searched in. Way outside of my normal search area. It’s annoying and not worth a notification. That being said, I’ve been a long time user of this app and will continue using the searches and filters to help in my real estate searches. Just not a fan of the excessive “recommended” listing notifications. The app needs to allow searches for specific school districts or rated schools and the opportunity to include or exclude private schools in those searches. Awesome app with great color and sharpness and ease of use! The app works well, stays current unlike other home search apps, and the overall ease of use is good. Being current makes ALL the difference. I only have two complaints: 1. When I enter a price range to filter, the app will only show me houses on the very high end of my chosen range as opposed to the whole range. 2. I'd like to only search for brick or stone homes the app lacks "building material" as part of the filters (wood, stucco, brick, stone, manufactured, etc.). Love how easy you can find a property for sell close to where you live. Found my dream home and the best realtor ever on this site. The app is great and very easy to use. This is a really good app to help you find a house it very detailed and that’s why I love it . App is a great tool for house hunting and price comparing for areas. This app is slow, unresponsive and baulky compared to the browser version. Really helpful, but I hope the new update is better. Seems to be freezing up on me a lot. Hi! I love the app but I went on today and when I try to save a house by clicking on the heart something pops up and says “Home can’t be saved something went wrong” I logged out and back in. And it still says the same thing. Any ideas? Thank you! How come listings show up as available on realtor, but then they are pending on Zillow and other websites? I don’t want every link for Realtor.com listings to open in your app and I hate that I can’t send another person a web link for the listings instead of - here I found this on this on the app, please, not everyone wants the app! Yes it makes it easier to search because the mobile version of the website is even worse then an app. Very frustrating experience. I guess I’m not using Realtor.com anymore. When you click a picture, it goes to the wrong one! I like the realtor.com app and have used it for years. However for the last few months, when you are looking at all the pictures at once (where they are side by side), and you click on one to make it larger, it takes you to a different picture in the listing - usually a few back from the one you are trying to view. It is sooooo frustrating. I’ve spoken with a few other people and they are experiencing the same issue. Please fix this, as I have been using other real estate apps bc of this issue. It shows houses for sale just like it should. Great site for sure. Always up to date! I apply my criteria to search filter including low, high price and property type. My lowest price was $150000 for condo only. I got over 9000 mixed condos, single families, land and it’s. App useless. Would like for it to be more informative when it comes to the homes. A lot of times you only get outside pics of the home. Sometimes this app is great and other times I feel like it’s not as updated as other house app. Other house apps show updates first . It works great but like most real estate apps it doesn’t show you everything available and some listings are very old. Prefer website. The same info doesn’t seem to pull up on the app. Great app. Would love to see more photos on some listings. Helps me track what I’m searching for and keeps up with price changes. Love the app! Very up to date. I absolutely love the Realtor app! I absolutely love this app! So timely with alerts and updates...as both a home seller and buyer Realtor made the process, which can be overwhelming at times, much more manageable. I love this App, because it gives real time information. Love the updated app. Easy to navigate. Sometimes it’s hard to get to what you want and for some reason my notifications aren’t working correctly-previously I had enjoyed looking at what was chosen for me. Over all this is a good site to use when house hunting. 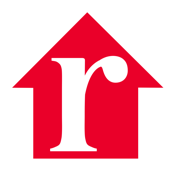 Realtor.com is a great help for those of us who always seem to be on the move! Very useful when looking for properties. Helpful app! Wish had a closing cost estimate. I like the options on the search criteria. I wish they added a "single story" criteria which would help me find a home quicker. But the pictures are clear and I like the satellite option on the map. The only resource for active property for sale you’ll ever need. Accurate. Real time. Realtor.com is great. It gives a lot of good information. I wish they would include the MLS number when possible. One of the things that prompted me to recommend the app in the past is no longer available and makes the app less than useful to me now - no better than Zillow or Trulia. You used to display HOA fees for each listing - an important consideration to buyers and lenders. Now no one quotes the fees. So very sad! I have use your app and website for a long time, several years. I’ve had a couple A couple issues. First issue is with The fact that many homes are not listed on your website. It makes it much more difficult to have to go to individual websites. Second is location always has an issue with tracking. Edit: I meant homes that are for sale don’t show up on the app or the website. The most accurate info, great app!! I like the app but wish there was a spot where I could make notes on each listing, such as: small yard or like the tile floor, etc. etc. If there’s a place like this to make notes, I don’t know about it. What I think that is very annoying every time I move an inch on the map all the prices disappear then comes back . That didn’t happen to the old version . Hate the update. If I'm looking a a location that has 300 hits, the new update automatically goes back to the top!!!! Really bad! Best app to look for houses on sale at your favorite neighborhood. Love the pics too, the give you an idea of what the house looks like. The app is always up to date and user friendly. Would love to be able to change the down payment info so that it would give a monthly mortgage scenario. My notifications are not showing. Should I delete the app and reinstall? 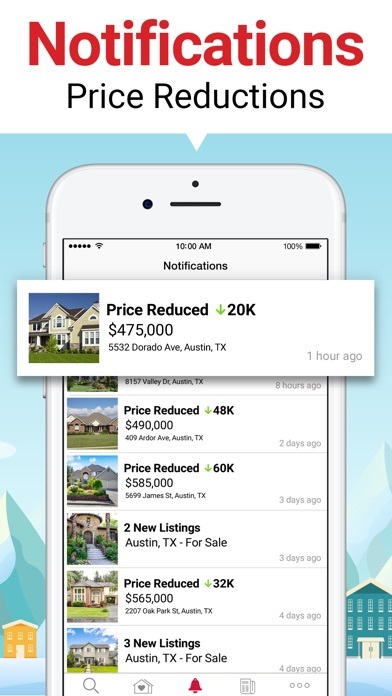 ...let notifications search for recent homes, new listings since the upgrade to iOS 12. I have a screenshot. Do you want to see it? Great home detail. Local school info. Tax info. Search is comprehensive. It helped us find our home. 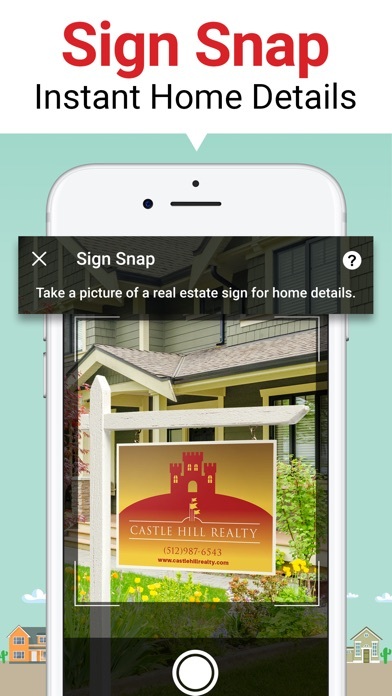 I have try few realtors app as so far I enjoy this one the more because I can be more exact with my search. Must have for hunting great deals. It has everything I need for looking for a new home. Great easy to use website!!! Great app & use it often. Its stable most of the time & can be a bit slow, however 85% of the time its outstanding. I like to search in Map View, and much of the time the streets and street names don't show up. Even customer support is baffled. An invaluable tool if your in the market for a home. A great way to quickly and easily search for your next home! Never loads half the time. Since the individual realtor did something in the office to stop a constant activity for a previous inquiry I lost all other notifications and I am not able to turn them back on on my own. That individual hasn’t replied to my messages for more than a week. Ability to search by lot size is a game changer. Good app but would like to see: 1) Filter - Amenities (Master on the Main) An option on filter to select “Master on the Main”. We are currently looking for our “last” home purchase and do not want an upstairs master. The lister does not always outline this in the overview. 2) Filter - Amenities (Pool) An option to differentiate between a community pool or personal property pool. Currently when selecting “pool” on filter, you receive homes with pools in backyard AND community pools and you have to scroll through the pictures or details to differentiate. Additional filter great to have would be between in-ground and above ground pool. 3) More Details - Bedrooms & Bathrooms Show how many bedrooms and baths are on each floor. This feature used to be in place and was the main reason I used over other apps. Now it appears to be gone. Zero stars if I could! Search results are erroneously incorrect! Nothing is done to fix it! And, now there’s even another problem! Ba-humbug! Well worth using as your default real estate app whether buying or renting. I always enjoy Realto.com, I look at your app. everyday to keep up with the housing market in my area. This app is so easy to use. I love that gives you the satellite image so you can see what the house looks like from above, and also with the surrounding houses look like. This is a quick and easy way to look for homes. I love that I can put in my exact search area & see everything available in that area. The listings always show up on Realtor.com before anywhere else. The app is super easy to navigate! I love the app, but I wish Canada was included! Soon to retire. Like checking areas that I frequent for downsize homes. This is helpful being able to see a few homes automatically that come to my phone. In trying to decide exactly where we would like to move to retire with a change in scenery and affordable housing. Realtor has been a great help. We're already liquidating and getting rid of a lot of our heavy furnishings preparing to sell our home and look forward to finally selecting a home from Realtor. Behind in many features other apps offer. Active with offer is NOT working! Great app, but disappointing that the feature that shows whether an offer has been made on a house or not does NOT work. Very frustrating when searching for homes only to find out an offer has already been made on a house you like. Helped us buy our house! Was looking for a house for almost a year, this app helped us to buy our forever home. I love this app, but suddenly I can not view my notifications. I like all the information available with each house. Wish there was a search that I could use to find proper price, bedrooms and baths, instead of looking in particular area. I’m kept continually up to date on the real estate market. It is great having an app at your fingertips to check on possible homes. Realtor.com presents helpful information in an easy to understand way. It is clear that the app was well thought out with house shoppers in mimd. User friendly, easy, up to date, better than zillow by far! I wish that when a home is posted and filtered as having a pool, there was a way to filter out those homes that are just part of a community pool. There is also an issue with 55+ communities not being filtered out. Love To see that it’s always up to date even with homes and prices. This was the best house hunting app until yesterday evening (9.26.18). Now you filter but it doesn't actually filter. Despite having the option to do ‘community pool’ anything even hinting at pool it will show it, houses available jumped by more than 160% - but none of them have pools, but they are ‘near a pool’ ‘pool within 20 miles’ ‘community pool’ ‘pool table’. Seriously?? Downloaded the new update and concluded that it sucked after about 10 minutes. Was trying to figure out how to get back the version that I liked. Ended up resetting my phone and restoring my settings from my iCloud. Was able to get back the much better version. FYI. I love to follow real estate. So I not only used this app to help me find my current home, I also use it as my entertainment. I wish I could look up home by the MLS number. If there is a way, it’s not real clear. I also wish I could put in an address in the search, or a neighborhood name. Enjoy browsing the site! Offers a wide variety of homes for sale!! 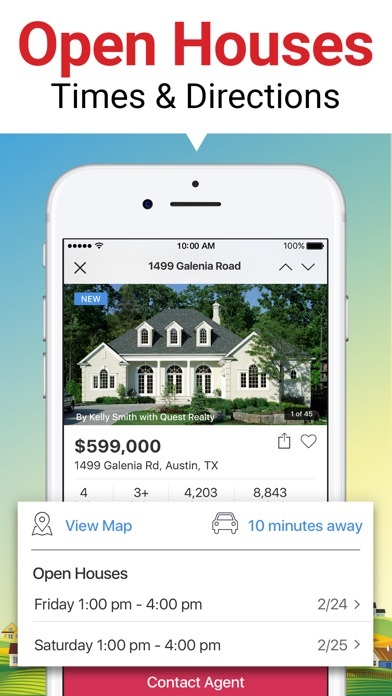 This app makes house hunting great! You can see the values & window shop easily! What happened to showing HOA fees? I like this app but with the newest upgrade it seems as if the HOA fees have disappeared. I know some of the townhomes with amenities and gated communities have them but all the ones I see now don’t mention the amount. (They always showed up before!) Frustrating because that is an important thing to consider as a potential buyer! Put them back please! Not liking that you can no longer see the dimensions of the bedrooms! Please bring that feature back! So much needs to improve. Doesn’t find the options entered. Need to be able to search specific parts of a town. I love this app. It helped me tremendously when I was looking for my house. Now that I have find my house I still like to look and see what is for sale in my neighborhood. Okay so, I love this app! I recommend it to everybody! I personally, only did 4 stars because whenever I whenever I try to use it sometimes it won't load. Not very current nor frequently updated when looking for either homes or apartments when compared to other real estate apps. Helps my family and I are searching for our next home. My husband has to drive far to work, so we are looking to be closer. This app helps a lot, especially with pricing. I really liked this app until I filled out my info (phone number is required) for the realtor to contact me regarding one house. I don't put my phone number on anything unless absolutely required and shortly after doing so, started to get mass amounts of spam calls (still am). If you use this app, under no circumstances should you give them your personal info! Easy to manage and find your home. Great app. Fabulous app always have found our new place . Will always continue using and recommend to my family and friends. Thank you . Your the best !!!! I have used this app on several occasions and every time I tap on a specific picture while looking at a house it takes me to a completely different picture. Also I’ve had problems with it not loading the pictures at all. In summary, the app has never worked correctly each time I’ve used it. Bug when maximizing a single picture. When I select a picture to maximize to a single view, if it is after the first add the picture selected is not the one maximized. Instead it is the picture 5 frames previous. Hope this can be fixed quickly as it is slightly annoying. Otherwise appreciate I the filters. Feature request: Would love a search by $/sqft. Thanks. LOVE the Real Estate Updates for New Listings!!! Based on the Criteria and Search Area that I am interested in. Love it for my real estate search. This app makes is so easy to drill down into what you want. I love the draw tool to get listings in a specific area. I enjoy staying on top of the latest listings. Great informative app! This app didn't get any better after spring update, in fact it got worse. The app still gets stuck on a particular filter and will not update or it just won't run at times. It says the pictures don't exist when there are photos. Here's the best part-if there's a way to open a map on the iPad version when going from list view, it isn't in the same place you'd find it in the iPhone and web versions. I heard somewhere checking location is important. I'd give it a zero especially after the recent, long overdue update. Love using Realtor.com, much more accurate than using Zillow or Trulia. Keep up the good work Realtor.com team!! Overall a great tool and accurately reflects the market. We literally found our home with this app. We requested our realtor show is 7 homes and we ended up buying the last home. How Long has home for sale been on market? So important to know that up-front & center! These app has more properties than Zillow for obvious reasons, clearly marks the name of the subdivision or community, it’s simpler to use, has crime and school data much much better. Thanks for the iOS 12 update! Initially this is a decent app, but after awhile of using it the alerts for new postings are not always accurate or are duplicates. Sometimes it will say I have 10 new alerts but then when I click on it there are only 2. The frequency of alerts lowers a lot too, I sometimes go weeks without receiving an update from the app. Also the alerts don’t follow the parameters that I set up for my dream home. I do enjoy the map part, but I wish houses would stay marked as viewed on the map if you’ve viewed them. After awhile they will revert back to unviewed. Provides everything I want in my search. very close - but no prize. i am cautiously optimistic. zillow - filled with scams. beware. Tôi cũng đang tìm nhà để mướn. Ở Appartment không được tiện đưa con cái đi học. I am loving this app better than Zillow. However if things can be sorted as to type of loans. That would make it even better. Would be nice to look at a list based on what I am looking for and the type of loan I have to use for purchasing. I love the collage of pictures! Realtor.com gives me great information on potential neighborhoods, homes and comparisons. I love using this app! Great app to use while searching for the most recent houses listed. I would like to suggest listing neighborhoods of the homes for those buyers looking for certain area to purchase only. I love the easy to use filters and current information. This app makes the first step in home buying fun. You can browse neighborhoods, towns or other parts of the USA easily. The properties listed seem to be more current, than other similar apps, but it could be improved. Still, I was able to help my daughter find her next home last year using Realtor.com. I would recommend explaining what the difference between the “relevance” sort and the “newest” sort are for users. Also if you could add “no rental cap” as a filter. Lastly if you could add a filter for carriage homes which aren’t technically multiplex but great investment opportunities. Quickly find homes in any area. Easy to navigate! Easy to navigate and simplistic.. To the point!! Great app.. Enjoying this site to hunt for my forever happy home. Lots of houses and pictures. Great App. Thank you.. I am enjoying the ease of using your app! Great app if you are in the real estate market in any form. I tend to prefer the layout of this app over Zillow. There are times when Zillow is useful to augment Realtor.com, but for browsing the market, Realtor.com is very user friendly. One star deducted due to occasional hiccups with saved listings and notifications. I've bought two properties using the listings on this app. It always works beautifully and gives you the pertinent information in a convenient layout. Realtor.com crushes its competition. More properties and the app is efficient. Horrible app. Not easy to use. Doesn’t update correctly. Start over! This app does not show all listings, you can look at an area with app and will sometimes show half of the actual current listings that are on Realtor.com This app needs serious work, the draw area option also never shows listings as it should. Unfortunately this app is completely unreliable. Super easy to use, great for finding the perfect home! I love looking at homes. I found my current home using it. Every time I go into the app it tells me something went wrong. I have deleted the app and reinstalled it several times and it still gives me the same message. I have use your app and website for a long time, several years. I’ve had a couple A couple issues. First issue is with The fact that many homes are not listed on your website. It makes it much more difficult to have to go to individual websites. Second is location always has an issue with tracking. This feature stop working a few days ago, I still get the pop up but when I go to the app there is nothing. Also it will be nice if it can saved the specifics I'm looking for (number of bed, bath, pool etc). Thank you. Zillow and Trulia provide much more information than Realtor.com. What more needs to be said. Great information and up to date ! This is a great app for when you want to see what is available and where!! This makes house shopping so easy!! We are searching for a new home and use this ap frequently. My wife and I are searching for a 1 family this is very helpful. I love using Realtor.com to do quick assessment of any market I’m exploring. I love how accurate the data has been. I like this app but doesn't to have enough information that need to see on page. Such a fantastic app. Love it. I’ve been using Realtor.com for a couple years now. It is my “Go to” app for real estate, although I do like some features in Zillow. Over all, the way the app is laid out and the ease of use, as well as reliability is great! Because of Realtor.com, my wife and I found our first home in a great neighborhood and at a very good price. I enjoy the app very much and use it daily. Two suggestions would be to include a feature which allows for all the saved (“loved”) homes/properties to be viewed on the map. I think the list form is available now when a user can group everything saved by city. I think the map would also be helpful. And second suggestion is being able to rate each saved home/property through the phone device and be able to view comments. Currently this is only available on the desktop version. Thank you. Site is easy to navigate, keeps me up with new home listings. Recommend to friends. I have not had enough exposure to this app yet, just started. So far good results and info. Love this app. Could you add Sort by Oldest? Has it all except long term house sitters. I really like that this app has listed houses sooner than Zillow or other apps, but I don’t like that when I use the filter sometimes it doesn’t actually filter based on my specifications. In general though, really easy to use! Awesome app!! Everything you need Yo know in one spot. Very detailed with easy to access information on realtors,financial lenders and credit resources and options. Love this app!! Works great no matter where I’m traveling and has listings days before other sites!! This a great app for those who don’t have the the luxury of a Vehicle. I have three Friends who found homes within their Buget to purchase. Used to be easy and intuitive... now, not sure what the heck .. limits searches..takes more time,less filter options Zillow is much better!! gives so much useful information!! Love Realtor.com app ... right here on my phone !! I get alerts when a new home goes on !! Awesome !! Super easy to use and perfectly formatted for smart phones(iPhones!) Love the pics! Everything flows easily and content is awesome! I use the ap all over the country to stay on top of trends. Love it. This app has the most up-to-date information and I love the image gallery format. Simple and powerful! Two days ago, I would've said this was the best real estate app out there. Suddenly, all the listings disappeared and I keep getting error messages. Now I'm just leaving the map open with the crime overlay while I check out listings on Zillow. Fix this app please! I miss it! I like this app, however I wish there were more filters that were available, like to search fo a swimming pool and to draw a circle around the ares you want to search. Otherwise, it is a good and reliable app. Unfortunately we had to stop our search. But the app was great! Two big issues: 1) When clicking a property, the selected pin remains red and does not turn pink to visually show users which pin was selected. Please fix this immediately. That’s how it used to work. 2) Realtor.com changed the map it uses. It’s less useable now. Before, I could quickly tell what areas are wooded by seeing where the dark green areas are (e.g., the Sierra National Forest). Now, the entire map is some shade of green and it’s really tough to distinguish wooded areas from non wooded areas. I use realtor to locate properties and view photos prior to contacting any realtor for the purpose of saving myself and the realtors valuable time. Many times however the listing information differs between properties looked at. For instance on property may show how long it has been listed on the market while another I am comparing it agains show nothing about this. Some properties show a Last Sold For while others do not. Finally, regarding Condo listings along the beach, some identify the Condo unit number and Floor location while others show nothing about the location just listing the Complex Street Address. As a user I would like to know the Condo Complex Name, the Street Address, the Unit Number, the Floor it is located on, and the View (if applicable such as Beach View, Bay View, Park View, etc. There are inconsistencies between listings regarding such information. Regardless of the above however, Realtor is still the best real estate source I have found to date. I love the features and and it user friendly. Love using the app because it gives me everything I want to see on the details of the house. I only thing I wish it did have is wider range of lot sizes to filter from. I can’t tell you how many times we’ve gotten excited about a home on Zillow only to discover that their information was way off. Realtor.com to the rescue. Now it’s my first stop when checking out real estate finds. Wish I could search more than 20 miles from home address. Looking for a cottage up to 70 miles away but with this app it’s hard to do. Love it! Very easy to use and seems to be up to date listings and details. It’s great to find homes in my area that I didn’t think I could find. Easy to use app as well. This is the best house hunting AP ever! Worse update ever. What are they thinking. I love spending time looking at homes from the comfort of my easy chair! It makes housing hunting so enjoyable! I lov this app I’m able to mark house that interested without signing in. This app is wonderful!!! Awesome site, it’s going to find my new residence! Generally speaking, this is pretty good. Easy to research homes, especially in a hot market like North Texas! App seems to no longer be working. Realtor.com is the only app I use to look at homes. Love it. So easy to search Beautiful pics, good info. Very happy and I get to share my searches with my Daughter so we can decide which homes suit us. It's real time better than all the rest. Very accurate those other sites will still have a house listed and it's sold already. Wish there was a separate section strictly for open houses but the app is great nonetheless! Love the alerts except for when they won’t pull up! Easy to search and set alerts too. All in all I’m pretty satisfied with it! Great app for searching out a Home or Apt. This app is very user friendly on my iPad. I love the way it shows the price of the home for each location on the map. Works as expected with great user interface. I like the idea that I may sit in my home and look for the area I want to live in. I look for style, size, area, price and type of home I want. I can drive the area to decide if I want to live in it. Then I will contact the agent to get me in to look at the place to decide if I am interested in it or not. Very easy to use. Updates regularly. I’ve been a realtor for 5 years and this app has been the only app that I’ve relied on! It can be quite frustrating to pull up in front of house with a for sale sign in the front yard but no listing on Realtor.com. Also, the detailed information in a listing is incredibly inconsistent. This is the result of having so many realtor organizations across the country. Realtor.com provides a great resource when searching for homes. It gives a detailed explanation of the property, great pictures, and all of the information you need. We found our dream vacation property, but I still love to look at the properties that are out there for sale! The site is very user friendly and provides tons of property listings! 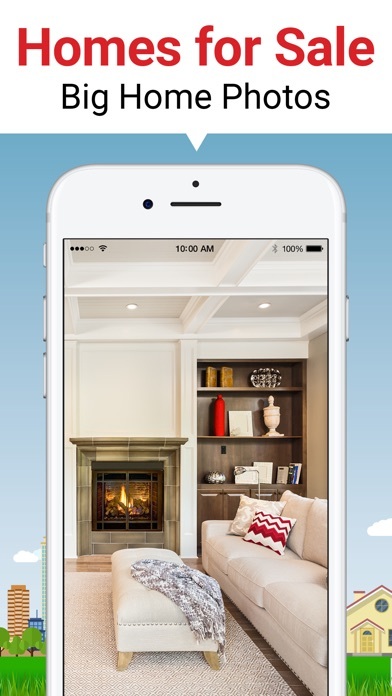 Awesome app for investors and home buyers! Best app out there for home searchers!! I love this app it’s very convenient. When I’m in an area where I see a house I’m interested, in I can easily find it with Realtor.com. Used to love this app but recently it’s not loading pictures, it’s freezing up and force closing. What’s up?!?!!! The title says it all. This app allows me the chance to view homes all over the country. I am especially interested in Palm Springs California so been looking. I also love to see what homes are for sale in our neighborhood and keep tabs on our property values. I think that is enough for now but thanks. I used Realtor.com to find the home of my dreams. Great app. Found my home and purchased within 5 days of being listed!! Spent many a day searching the site and it paid off! Have enjoyed using. Timely and extremely handy. Second time in three years searching for a home. Realtor.com lags way behind the other big apps. Even tried to call them, but was told ‘it works fine for me’ by someone there. Try not to get too frustrated, even major realtors think it needs work. Guess they are content. Love the notifications you get based on the parameters you set for the properties you are looking for. Love this site, so much info! I love the ability to customize the search’s and settings in this app. It is really an awesome tool that allows a person who is out in the community actively looking for a property to have some level of understanding and certainty! I have searches based on cities and distance. But the app includes homes in my search not even close to the locations I’m searching on. Overall, the Realtor.com ap is a very good platform. My only critique is the limited search capability. This app always fails to load when driving and puns to look at homes. Easy to find what I want. This app makes it quick and easy to find what I want, where I want. A great resource. I love, love, love this app!! I love the computer version, but being able to take it with is the best. I noticed that if I changed the minimum bedrooms or bath to anything else besides 0, nothing shows up because everything is listed as 0 bed, 0 bath. Please also show current rents for investment properties, it used to. And I’m not even in the market for a new home. It's rather easy to find properties in areas I'm interested in. It’s important to me for the updates to be handled in a timely manner. Keep up the good work! There are many apps, but realtor is my favorite. Very friendly, and practical tools. Slow with new inventory, and inventory updates. I have a couple of apps, this one kinda lags. This app. It's awesome it's always up to date. Like it very much! Keep me appraised of what is important to my business! Good app to know what homes are available without needing a list from a realtor. The app is great, new houses show up frequently that are within my price range and vicinity. I am frequently giving my realtor a heads up as to new homes on the market. If you had a means to enter a ZIP Code for research it would be a lot more effective. I’m trying to watch a particular search area and I have to move the map every time to look at it. Also a button for land only would help. I prefer to just go to Realtor.com than to use the APP as it easier to navigate. More information and timely. I had a house go up for sale in my neighborhood and tried looking it up by street address and brokerage. I never was able to find it. Even looking into sold properties there wasn’t anything there. ??? Very good and easy to use. Being able to see satellite image is great as well. That being said, I take off one star because they don’t save or offer enough search preferences, or at least not easily enough for me. The result is that I see too broad of a collection of possible homes but then they aren’t within a 1 hour drive of work (for my husband), or single story homes or near public transport (for me). I like having new home sales at my finger tips, but... it changes my requirements each time I open. Best app ever. Easy to manage and to understand. You can put in almost a specific parameters as you want perfectly fine to need your Ultimate dream home search. I like the app. I just wish I could find the taxes and figure out the monthly estimates. So many wonderful features but what I like most are the updates in areas I am looking at! The app is supposed to have the latest and greatest information. Right now showing properties for sale that have been closed on already, or old prices from months ago, disappointing. Love this app .I think this is the best real estate app out there so easy to use. Besides Zillow and Realtor.com, I use nothing else. Thanks for a great app that provides best in class features! Love keeping track of local re. Most of the time it works as intended. Sometimes pictures will not load, nor will the details. Also it doesn’t always reflect accurate information as properties may have been sold or placed under agreement yet they still show up as available. The app works the coding doesn’t. It’s hard to rate an app that can’t seem to get the correct picture of my home. Zillow has it correct. Great photos and information on homes. Unfortunately the data in many cases is not up to date so this leads to frustration if you really want to buy vs. just look for curiosity. I am all the time filtering out new construction on the app yet they are always listed after I filter them out. There is also no way to differentiate between houses with pools and houses with access to a community pool. Always the best properties. Love how easy and accurate it is. Gives me the ability to preview what I want to look st in depth later. I used to love Realtor.com but since you’ve made it more difficult to see the houses I’ve stopped using the app. I’m more interested in how the houses look than in the map. This is the best home finder site out there. Accurate and fast finds! App shows homes that have been sold months ago. This is outdated and unhelpful. Nice to be the first to know! I’m on this application all the time looking for places for myself and friends! Love the having the option to see at anytime what’s available in any area!! Phenomenal app. Love the fact that it’s able to give you the taxes for each property. A major bonus in the tri-state area. This app is terrible. It is continually restarting and loses saved searches. Love everything about this app. I’m actively looking in my market as a first time buyer and this app gives me all the information I need. The pictures are clear and accurate. Love the additional information for room dimensions and synopsis. The map is very helpful and it updates immediately to what is available. One of my favorite things to do is go on this app and look at new listings! It gives you all the information on the properties you need. I like seeing the pictures of the properties. There are just too many bugs right now to rate this app any higher. Sometimes crashes or when trying to see pictures, opens to a different picture than one you selected- but overall a good app. Pretty accurate and up to date on listings. For some reason, while looking at pictures of a house, it will jump to an entirely different picture. When I view all the pics listed and want to view a certain pic (say, the kitchen) I’ll click on that pic but then it’ll show me the backyard! I’ve signed out, forced closed, and even deleted and downloaded the app again but the problem persists. Also, listings some listings aren’t up to date. Some of the listings aren’t available anymore even though they’re listed. The only way to find that out is by calling each and every realtor, which of course, is NOT gonna happen. On the other hand, it doesn’t show ALL the homes that are available. Good app but I would like the get notifications if a house in my saved searches or favorites is sold or off the market. And get a notification if a new house is listed in my saved searches. If this already exists it’s not working. You need to keep the choice of either using the map or list. This split screen with a list and map of properties is extremely annoying. The Realtor app does everything I’d expect it to. I check it all the time to see how much homes are selling for in my area. Very helpful. Add “lot lines” and you’ll have a home run! The only reason I still use the “Z” app is to see lot lines. I am searching for what I want in a new home and hope to buy in early 2019. The search engines do not give good results and navigating the website is hard. I do not know why my location is used. I do not want to search where I am, but by my saved searches. Realtor.com has a nice user friendly format. I’m a real estate investor and I use yr app every day because is so easy to use and get all the info I need !! Keep the smart work !!! Great app. Easy, informative. It has it all! At last I have access to trustworthy data that I know is completely up to date. This app is very informative and easy to navigate. I like the updates on this app. Great options of for property search. Up to date listings, but forget the filters. Confident listings are up to date, I have trouble with listings if filters are set so I tend to not use them, otherwise app seems pretty accurate. Thank you for everything with buying and selling my homes. I honestly love using this app. It is so easy when you’re driving around looking for homes, it operates exactly as I would want it to. I am a professional realtor and this is where I tell my clients to go if they want to see new listings etc. they can put a search and and get up-to-date real information. I receive email notices for properties new to the market and when I tap the propery shown in email or on the “news feed” on the iPhone, the realtor app opens and plays dumb. It does not know the property I tapped to get the realtor app opened. Also the search features are sad on the app. It only gives a miles delimitation without any reference to my saved searches. Even when I expand the area of interest it still refuses to show what is available. This app needs a lot of work before it is functioning. How I found my home! You are always up to date with real time updates of availability, price change, current market price etc. I wouldn't use any other app for my home search process,,I give realtor 5*!!!!!!!!! I really love this app when it’s kept up to date, but when they have contingent homes listed as active when I know they have contracts, it irritates me. That’s not accurate information in my book. So only three stars today. They recently took all the contingent properties back to active. Very informative. I like that I can put work address and see how long it would take me to work in rush hour. Excellent app for searching. Can search by address, zip, map or price. Can then save favorites by address & price. I search through listings even though I’m not actively looking. Keeps me informed on market in my area and enjoy exploring other areas. This is the #1 app available. It helped us find our home! We kept our search going over several years in the same neighborhood until an opening showed up in the building we wanted and we jumped on it! Realtor.com is a fantastic tool to use for professionals and novices!